EVERY SPOUSE NEEDS A FRIEND. Who better to fill that role than the one who loves them most? 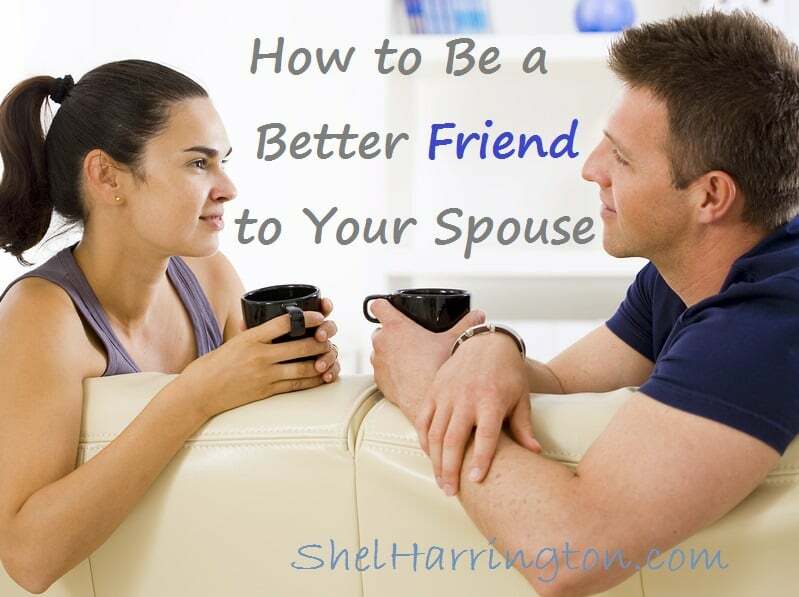 Whether you consider your spouse to be your absolute best friend, or you think the term “friend” isn’t significant enough to describe your relationship, we can all do a better job in being a friend to our spouses. You know that special buddy of yours that you only get to see once in a blue moon? The one you pick up the phone and call when you see something that reminds you of your shared history? Analyze how you treat them, how they treat you and why the friendship is special. What’s the expression on your faces when you see each other? How do you catch up on what has happened in each other’s lives since you last connected? Do you treat interactions with your spouse with the same enthusiasm, the same special touch? 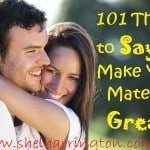 Here are 5 simple acts that translate well from such friendships to the most valuable friendship in our lives – the one we share with our spouse. 1. Let your face light up when you see them. What do I mean? Go stand in front of a mirror. Think about a visit from that favored friend that you haven’t see in ages – and how great it’s going to be to see them. See what happens to your face? Is your spouse getting greeted with that same smile and sparkle? 2. Show interest in what’s happened in their life since you last saw them. OK – maybe we should replace ‘life’ with ‘day’ – but it’s the same principle. Ask about it. And then really listen. Just like we wouldn’t presume to know everything about what’s happened with that dear friend since we last saw them, chances are there is much our spouse could chat about their own day to an interested listener. 3. Send a text, email, or – better yet – a letter, just to let them know you are thinking of them. 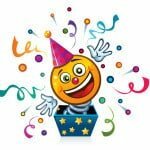 Sure, they may see you before they actually receive the written confirmation that you thought of them in the midst of your day – but it will still make them feel special and result in a smile when they see it! 4. Set a specific time to meet. I’m not talking about the oft-referred to “date night” – although that is a very good thing. I’m just talking about a connection that might not otherwise happen. You wouldn’t suggest to that special friend that you get together on Tuesday and leave it at that – you make a specific plan. Every once in a while it’s nice to set a specific time to hang out for a quick “catch up” time – getting up 15 minutes earlier to linger over a morning coffee, a 7:45 p.m ice cream connection before viewing the planned evening program. An it’s-all-about-us moment. 5. Tell them something you’ve always admired about them. We generally don’t hesitate to tell friends what we think is special about them – after all, it’s an unknown when the next visit will be and we don’t want to miss such an opportunity. In spite of the fact that (we think) we know when we’ll next see our spouse, we need to be intentional about creating such opportunities to lift them up. After all, our dearest friend deserves no less! They are definitely behaviors that turn into habits with regular use – always great to hear others have formed the habits, Jill! Exactly – sometimes we get so caught up in trying to create memorable moments the obvious goes by the wayside! I suspect your hubs will be shining the light right back at you, Carrie – enjoy your lunch date! Great reminders, Shel! I just texted S to check how he’s doing — he’s on a business trip. Thanks for inspiring me! And I bet your face will light up when he’s back home, Sonia! Have a great weekend – looking forward to catching up with you soon! Thanks, Lin – sometimes it’s the simplest things that go by the wayside. Have a great weekend – in spite of the fact that we lose an hour! Jim and I do all of the above except send letters to each other. However, when I’m going to visit my mom or he’s going on an off-roading volunteer trip, we each tuck surprise things in each others’ suitcases. It’s always a wonderful touching surprise to find notes tucked in socks, or chocolate Kisses hidden among dental floss, etc. Love the surprise touches, Marylin – which no doubt is one of the many contributors to the (enjoyed!) longevity of your union! Shel I love number one, often we get so busy with daily life when hubs comes home everyone almost ignores him, too busy doing their own thing. We all need to feel valuable within the dynamics of each family unit. I so agree, Kath! It’s easy to forget the simplest things – like saying “good morning!” before starting in on the day’s agenda! Hope you enjoy (what’s left of!) your weekend. All behaviors that should be habitual with a spouse…but all too easily are forgotten in the mad rush of daily life. We’ve been working on making things like these a priority and I can tell you firsthand it definitely makes a difference in the overall dynamic for the entire family. Win. Ahh – love the focus that the whole family benefits by the enriched marital relationship, Lisa. You’re right – definitely a WIN! It is a win, Shel. This morning, our Daughter told me in the car that it makes her very happy when she sees her parents “being sweet.” I’m sorry to say we had a bit of a long spell of arguing and she was unhappy about it. She told us “your love is stronger than your anger” and that pretty much made us realize we were over the edge. To hear her say how happy it makes her when she sees us treating each other nicely and actively hugging and kissing is a reality check. Perhaps we weren’t doing that enough. It’s sobering to hear your kid tell you that! I guess that would be sobering, Lisa! Smart kid – and smart parents to listen. Your words reminded me of this blog post I read recently from TrueAgape about why kids should see their parents date: http://trueagape.net/2015/03/5-reasons-your-kids-should-see-you-date-your-spouse/ – good stuff! That is a good article, Shel – just read it. Thanks! I really liked this. What a great reminder to treat your spouse like the special treasure they are. The burdens of everyday life can make you forget what a wonderful friend we have with us everyday. I like #5 best because positive words always help everyone, the hearer and the speaker. I agree on all points, Kristin! Nice to see you – hope you have a wonderful Easter!